Scientists at the University of Dundee have discovered a hidden `code’ that tells our key genetic molecules how to structure themselves, thereby allowing them to carry out their work. In a research paper published in the journal Nature Communications, Professor David Lilley and colleagues describe how a crucial part of RNA called the `kink-turn’ operates. Professor David Lilley and colleagues in the College of Life Sciences at Dundee have been studying the function of RNA, the molecules that play a significant role in almost every genetic function of our cells. RNA is chemically similar to DNA. It is synthesized as a long chain of components, but in order to carry out its myriad functions it must fold up into complex three-dimensional structures. Professor Lilley said, “Understanding this folding process is a great challenge, but it can be simplified by noting that there are underlying 'nuts and bolts' that hold the folded molecule together. “One of these is called the `kink-turn’, which acts like an angle bracket to introduce a very sharp turn into the structure, so bringing important parts of the molecule together. These key structural elements are very widespread, and are found in the molecular machines that make proteins, process RNA into its mature form, and switch genes on and off. “We have now discovered that buried within the kink-turn is a hidden code that tells the RNA how to fold. This has allowed us to establish a set of rules that can be used to predict the folding characteristics of kink-turns if their sequence composition is known. 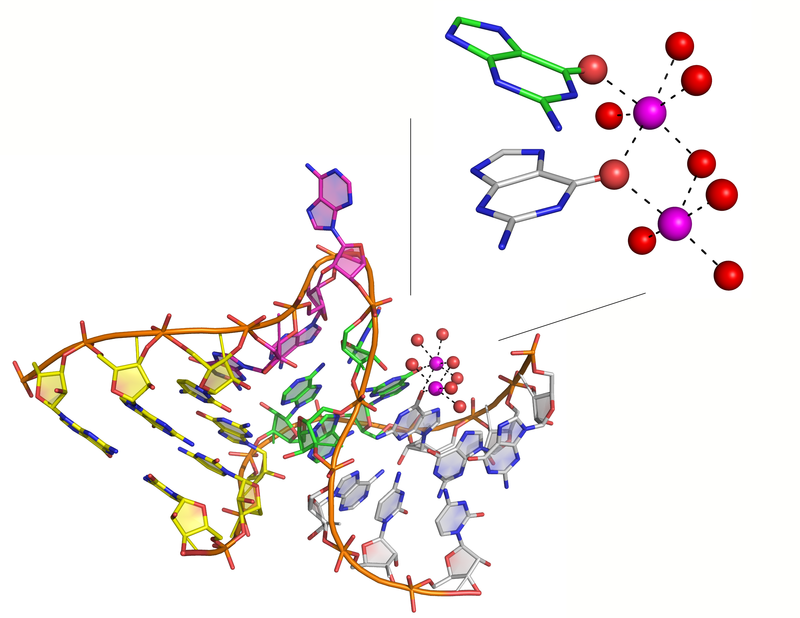 “We have found that different classes of RNA molecules have different code elements conferring different folding behavior, each suited to their biological function. By determining the structure of a kink-turn molecule using X-rays, Professor Lilley and colleagues found that atoms of a metal were attached at the element that codes folding behavior. The ability to bind, or not, these metal atoms determines the folding character of the RNA, and therefore its function in the cell.